Brandywine Valley Chorale, along with Unionville High School Chorale, joins forces with Christian’s Compassionate Mission for an uplifting concert that raises awareness to suicide prevention. The program features the Pennsylvania premiere of composer Dan Forrest’s newest choral work, LUX: The Dawn From On High. This five-movement masterwork explores various facets of LUX (Latin for “light”), in texts ranging from ancient liturgical chant to biblical scripture to modern secular poetry. During the performance, Brandywine Valley artists will be creating extraordinary works of art on stage. And an orchestral ensemble will accompany the singers. The BVC has a rich history of featuring wonderful local musicians to accompany our concerts. From fantastic brass players to inspiring wind ensembles, our most common guest instrumentalists are our glorious string sections! 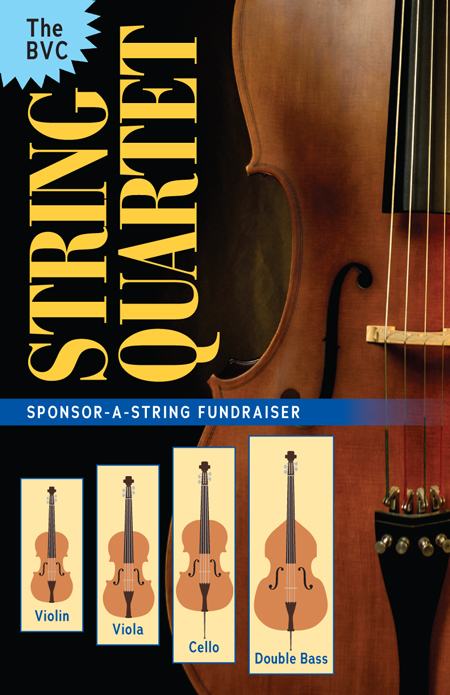 As a fundraiser, we are inviting our patrons to participate in our first Sponsor-A-String String Quartet Instrument Fundraiser. Choose an individual string instrument (violin, viola, cello, or double bass) to sponsor. You also have the opportunity to become a Platinum String Sponsor by choosing all four instruments (string quartet). String Sponsors will share the same benefits as our Musician’s Circle or Composer’s Circle sponsors, but will be acknowledged separately.